Joining our step into spring series today is the lovely Sheridan from Sheridan Anne, a home organisation, crafting, DIY and family centred blog. Sheridan has a “ready-made family”, is super knowledgeable on all things de-cluttering to sort out your life. She’s also pretty handy with a glue gun, a sewing machine or some pliers and loves scouting for a good bargain! 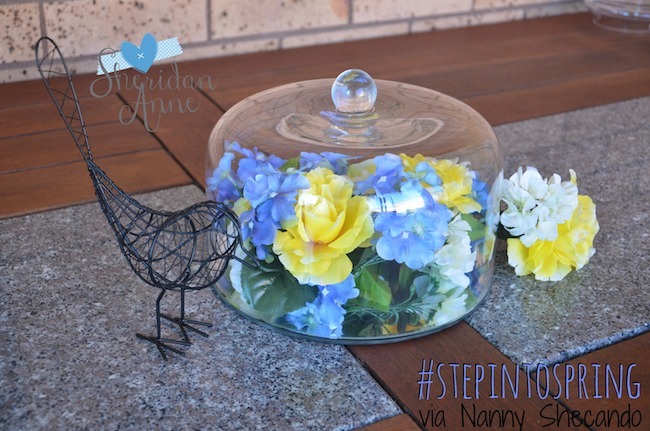 Step into spring with this easy do-it-yourself springtime centrepiece from Sheridan Anne, isn’t it just gorgeous! Thank you so much for having me Hope. I just love Spring. The “in-between” seasons are my favourite. I don’t know about you, but the warmer months bring a lot more entertaining, barbecues, and celebrations for my family. It seems to bring us all together. This year I have been focusing on organising one area of my life and home at a time. I’ve been so successful at de-cluttering that I’m finally getting into the fun part; decorating around my house! I really wanted to make something different to decorate my outdoor table, something that no one else would have. That’s how I decided to make this Springtime Centrepiece. As an alternative to making your own wreath, you could purchase a crown of flowers from a cheap jewellery store to use instead. If you decide to go this route, you can pretty much skip to the seventh step, and it turns this 15 minute project into a 2 minute project! 1. Clip the ends of your flowers with the pliers so that they are separated from one another (not too short, you’ll want part of the stem to fix each flower into place). 2. Cut a bunch of 15cm lengths of floral wire with the pliers and put aside for when needed. 3. Begin arranging the flowers how you’d like them to display. I started by leaving some stems long and shaping them into a semi-circle then building on that basic structure. 4. Wrap other flowers around each other’s stems. If the wire in the stem of the flower isn’t strong enough to hold, this is where you will need to start twisting floral wire around the arrangement to hold it in place. Use your judgement on which areas need to be held by wire and which don’t need to be. 5. Continue this process until you make it all the way around the wreath. Once you are done, fill in any gaps with extra flowers. Wrap the structure in floral wire to secure all of the stems. 6. Wipe down your mirror and glass ware. 7. Place the wreath upside down into the bell jar or cake stand lid, followed by the mirror upside down. 8. Turn the whole thing the right way and place on the table. Bonus points if you happen to have a cute little critter to join in on your centrepiece – I got this wire bird <<here>> from Kmart for $4! I hope you enjoy this simple and effective project. If you’re inspired, why not put a little spring into your step and give this a go for your outdoor table. And don’t forget that to share with us your photos, tag Nanny Shecando and Sheridan Anne in your Facebook, Twitter, Instagram, or Google+ photo. Share your step into spring tips with the hashtag #stepintospring! Thanks for having me Hope! To see more #stepintospring posts from Sheridan Anne, <<click here>> to head over and check out her caddy of homemade cleaners to help you get ready for the big spring clean! 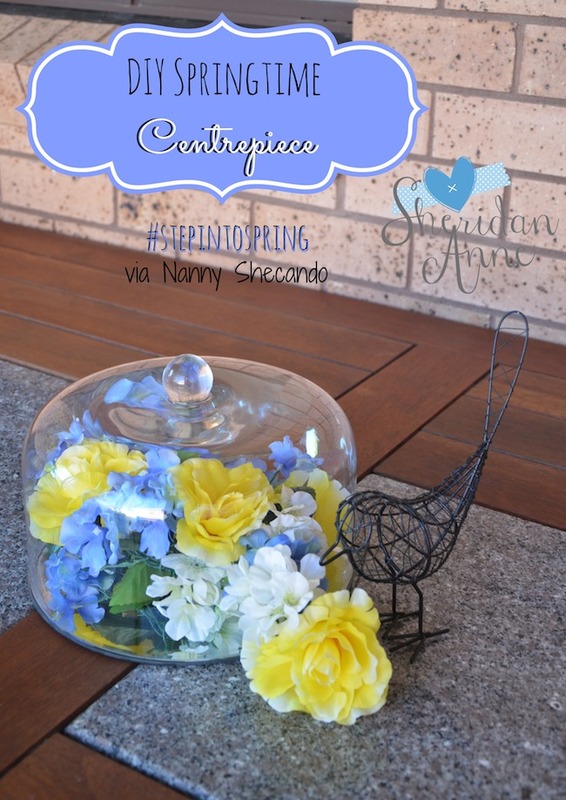 Step into spring with this easy do-it-yourself springtime centrepiece from Sheridan Anne, isn’t it just gorgeous! Celebrating the arrival of spring all week on the blog. Featuring some great “step into spring” tips to ease you into the new season, with favourites from Money Mummy, Mums Take Five, Sheridan Anne, and Hunting For Lady Bugs.You’ll surely be inspired to put a little spring into your step! Join us, and tweet your favourite spring themed posts using #stepintospring. 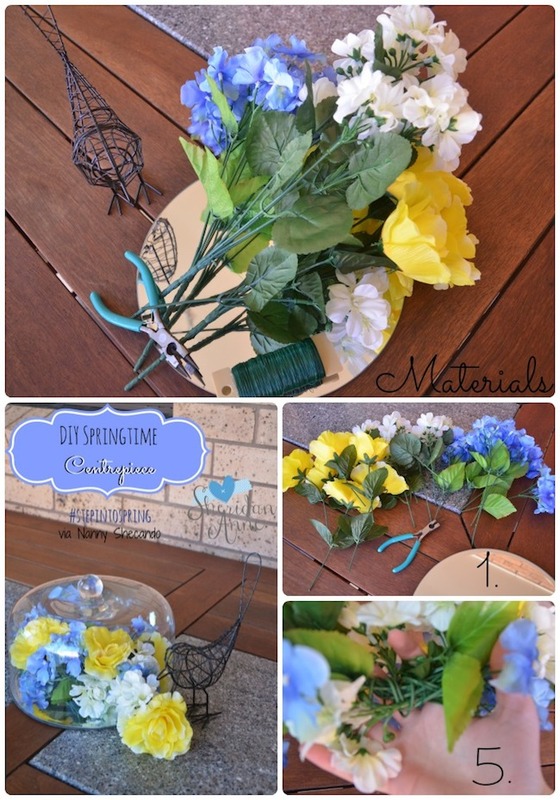 To continue the Step Into Spring series, I’m excited to bring you super easy spring crafts to do with the kids. Many of us use the arrival of spring to clean up our lives; to re-gather and re-order. But I also see it as a great opportunity to revamp some old craft projects, to go about your day at home with the kids with renewed energy. 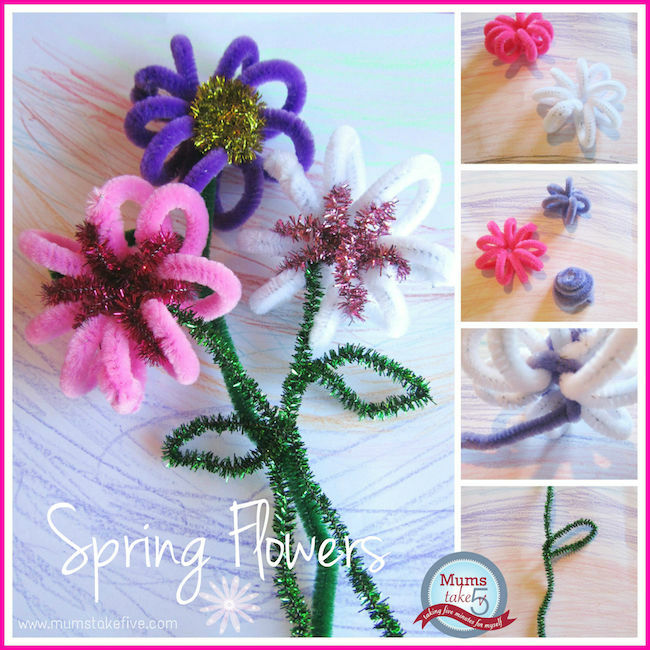 This Pipe Cleaner Flower Craft from Mums Take Five is exactly the kind of step into spring crafts I’m after these days – pretty, creative, engaging, but also easy! And with the toddler almost ready to enjoy a few more craft activities, it’s also safe and relatively young toddler friendly. 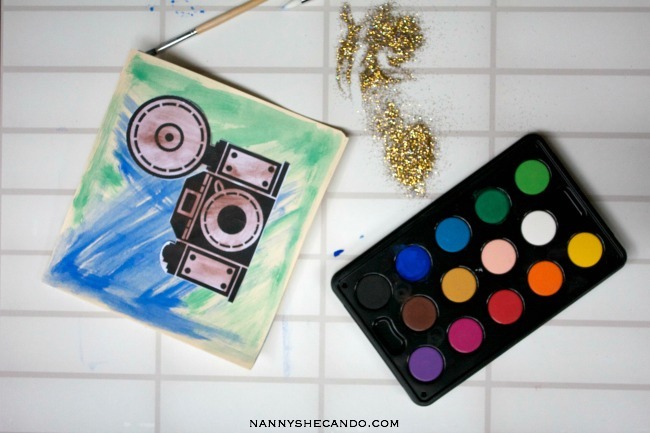 These are quick, fun and mess free! They’re also perfect for some easy kiddy entertainment – a big win in my books. Plus, you only need pipe cleaners! 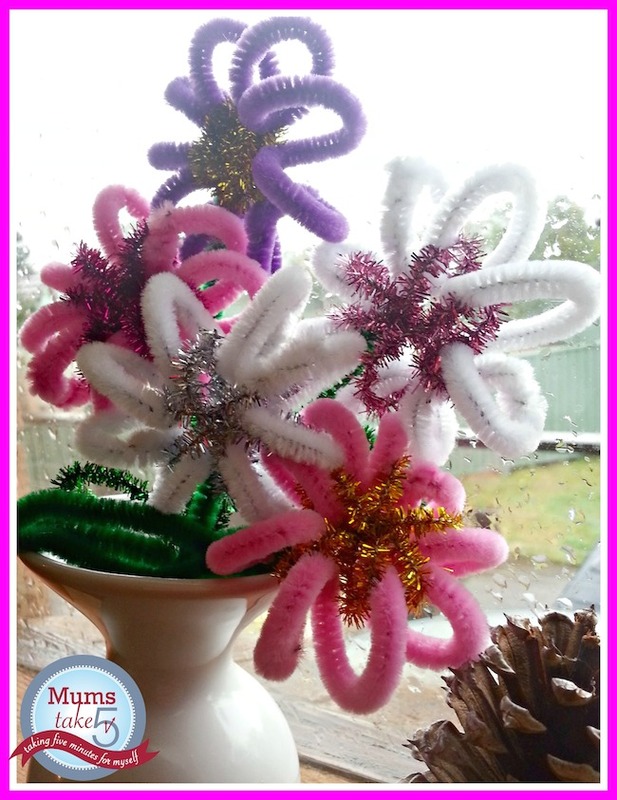 Pipe cleaners – really, that’s all you’ll need! Petals | start my making the petals of the flowers by wrapping one pipe cleaner around your finger. Careful, not too tight! Stamen | next you’ll want to make the centre Stamen part. For this, I use half a pipe cleaner. You can wrap it around your finger and it fits neatly in between the petals. Or you can wind it up like a snail. To attach the snail to the petals, leave the end unwound and feed it through the middle and tie on. Leaves | make a stem and leaf by folding a loop into a green pipe cleaner 2/3 of the way down, and then tie onto the back of the flower. At Mums Take Five, they’re all about taking five minutes for themselves. Which as busy mums, this can be easier said than done. But if you’re looking for something to cook, a quick answer, a craft to do with the kids or somewhere to spend a few minutes with a cup of coffee, Mums Take Five is the place for inspiration! We’re celebrating the arrival of spring all week on the blog. Featuring some great “step into spring” articles to ease you into the new season, with favourites from Money Mummy, Mums Take Five, Sheridan Anne, and Hunting For Lady Bugs. You’ll surely be inspired to put a little spring into your step! Join us, and tweet your favourite spring themed posts using #stepintospring. 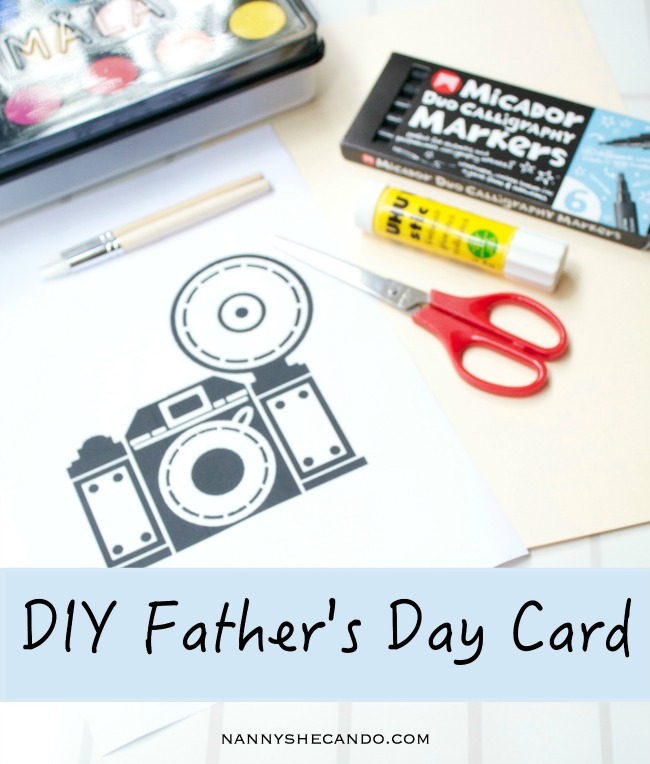 Finding a suitable father’s day craft has not been easy. It had to appeal to Miss 7, who’s a bit of a perfectionist and likes things a little more complex. And it also had to look fun and interesting to Miss 14 months if I was going to have any chance of holding her attention for longer than 20 seconds. In the end we came up with something, an activity that still involved plenty of coloured paints and stickers without the need for major action with the scissors. Miss 14months loves scissors and if we didn’t remove the scissors to high places, you could find her at any given time roaming about the house just casually toting a pair or scissors and chatting away. Of course that in itself isn’t that risky, but who knows what could happen. These toddlers are mighty unpredictable. 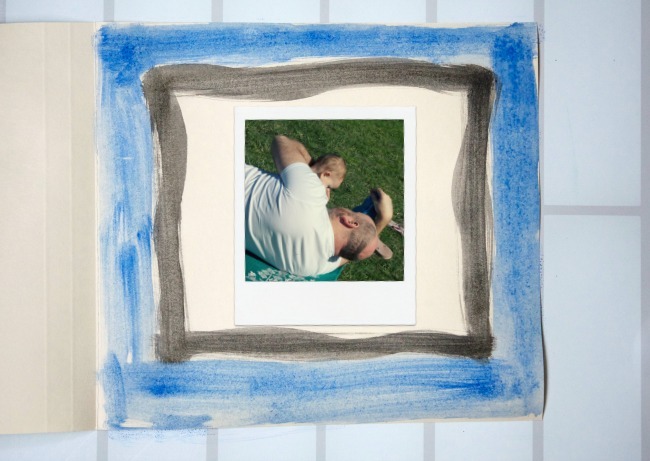 The dad loves all things photography, and is often capturing some of the most magical moments in his children’s lives. Some of the photos now framed on the walls of the house are absolutely amazing, and adds to the family vibe. So we decided to make a cute little diy card for Dad. With a fitting little photography theme of course! 1. Gather together everything you’ll need and clear a space. 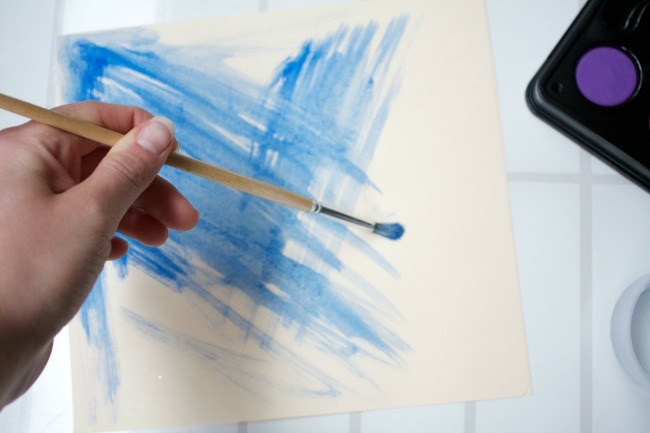 Make sure you lay down some plastic sheeting or butcher’s paper to protect furniture from the toddler wielding the paint brush! 2. From the card stock, cut your card to size. Note: we actually used a basic manilla folder as we’d used all the card stock making the DIY Book Parade Costume! Also, make sure you’re careful with the scissors and don’t let the toddler get their hands on them. 3. Paint the card any colours your like, then if using a stencil of camera drawings to glue onto the card, paint or colour those as well. 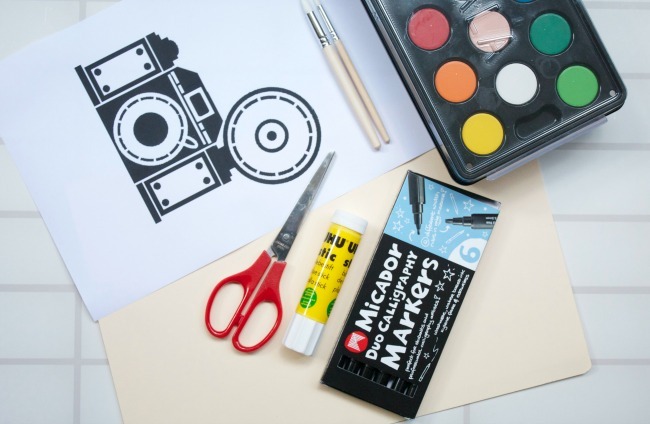 Once dry, you can glue the camera photo onto the cover of the diy card. 4. On the inside of the card (the right side of the page if you’ve got it open like a book), draw or paint a large rectangle in the middle of the card. This will be your photo frame for the kids to put their photos or message in for dad so that it’s “framed”. Just like daddy does with his photos on the wall! 5. Using calligraphy markers, like these Micador markers that we love using in our diy craft projects, write your Happy Father’s Day message to Dad on the inside left-side of the card. 6. 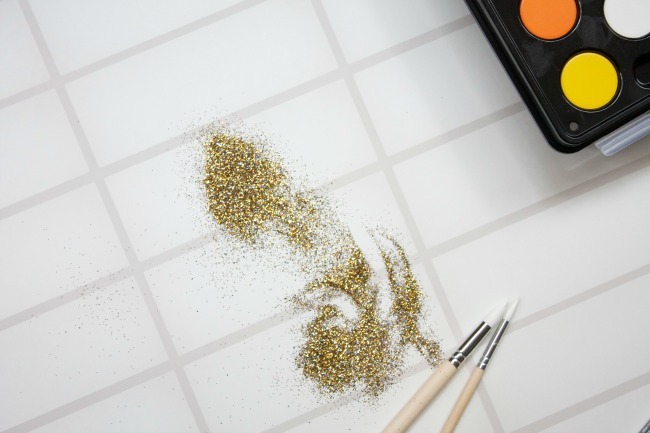 If like us, you love glitter and sparkles, then now is the time to paste clear-dry pva glue all over your card and sprinkle with glitter. The more the merrier – dad needs sparkle in his life too! 7. Leave everything to dry and set aside in a safe spot until Father’s Day morning. 8. Lastly, don’t forget to clean up all of your craft things and put them away. Deliver with breakfast in bed and big cuddle on Father’s Day morning! What are you doing for Father’s Day this year? Are you going to do a craft with the kids? When young kids graduate from reading shorter books to “chapter books”, they do so with a vengeance. For many it’s a grand achievement, a sign of getting older, of moving up a level, and of kicking it in the big leagues. For us carers and parents, we notice a difference too. Suddenly bed time stories become longer, and although more enjoyable, we’re often making bargaining agreements. Of course 15 minutes later, you’re onto the 3rd chapter because, “oh please, just one more chapter” is simply a request too good to refuse. But if your child is enjoying reading so much, and so involved with the story that they can’t put it down, it’s really not a bad thing is it? Given we want our children to connect to reading, to enjoy reading, and to willingly participate in the process, allowing one more chapter at night is really the benefit of achieving the outcome. Of course, graduating to chapter books does bring a slight downside. Because when you do finally call “lights out” and put the book away for the following night, you now have to remember your page. And if your memory is anything like mine, you’re going to want to write it down. Plus, whilst a dog-eared book is a sign of a well read book, many of us don’t like folding our pages. 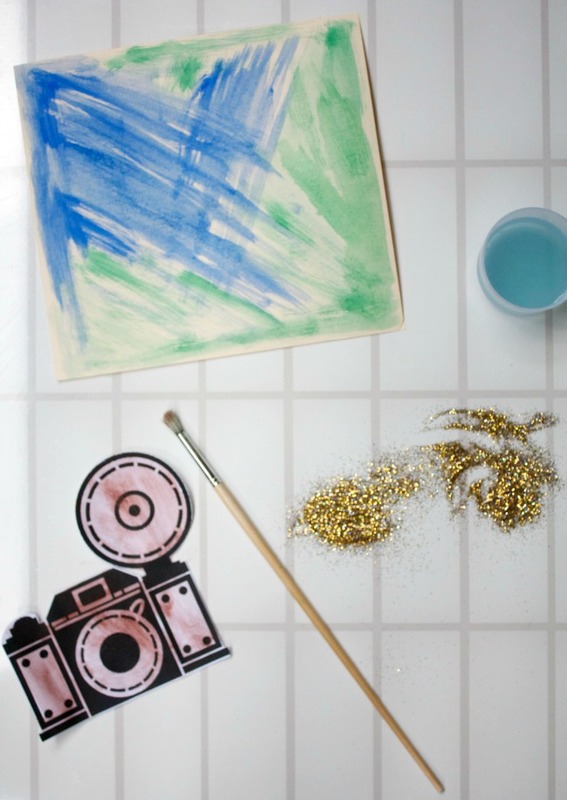 So today I’m sharing a fun craft activity to do with the kids to make these DIY Photo Bookmarks. No more forgetting page numbers! 1. Gather your items on a nice big table and let the kids pull up a stool. 2. Carefully cut our your desired bookmark shape from the coloured card. 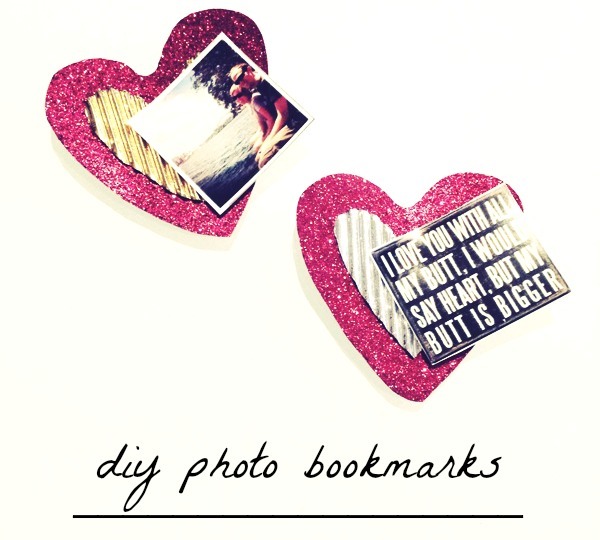 You can get creative here and cut a few different shapes and sizes to layer onto your bookmark. 3. 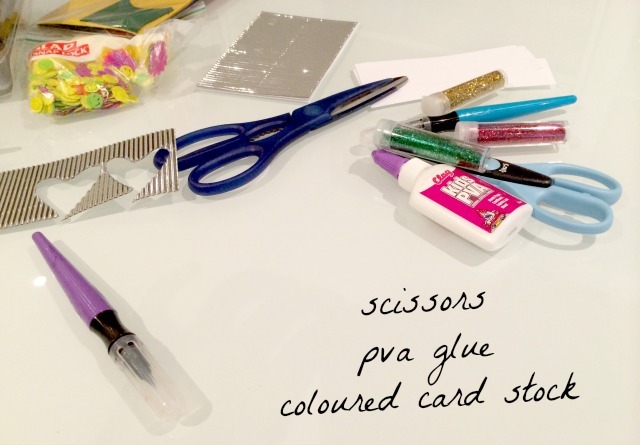 Glue the coloured card together to assemble the base layer of your bookmark. 4. Whilst the card is drying, select the photo you’ll be using on your bookmark and trim to fit to size. Tip: you’ll want to cut your photo to be smaller than the bookmark. 5. 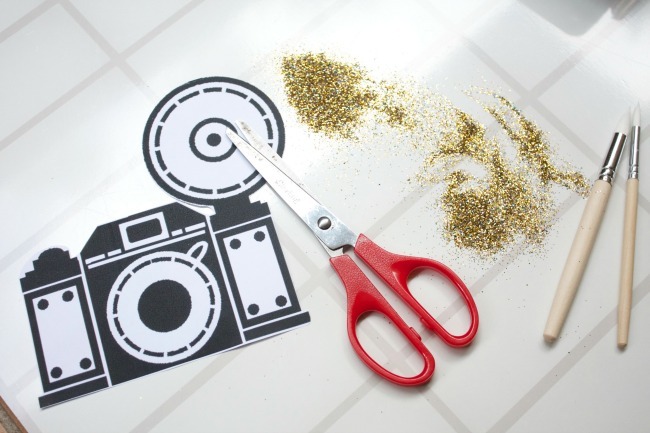 Offset your photo and glue onto the coloured card, leaving half of the photo free to be flipped up. This will be the “clip” that slips over the page of your book to mark the page. 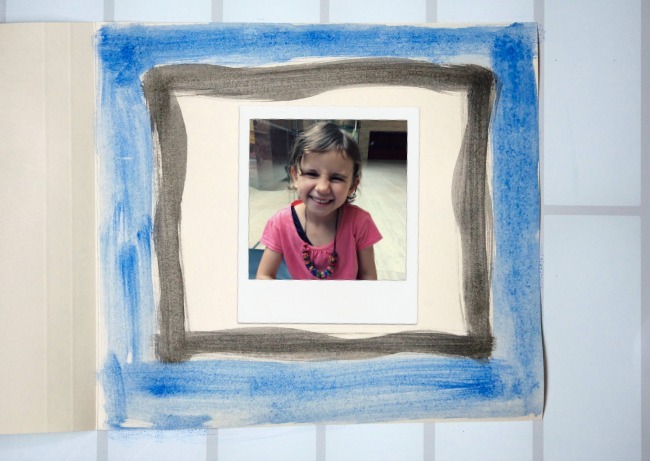 We used coloured card and shapes to make these fun photo bookmarks. However as always, it is open to interpretation. You could easily go without the photos, or make traditional rectangular bookmarks to slip among the pages. For a further embellishment, you could punch a hole in the tip of your bookmark and thread through some ribbon. >>> Are you a page folder or a bookmark-er?